Takaaki Kajita, from the Super-Kamiokande Collaboration in Japan, and Arthur McDonald, from the Sudbury Neutrino Observatory Collaboration in Canada (SNO), won the 2015 Nobel Prize in physics for helping to solve a long-standing mystery in physics: the disappearing neutrinos. Neutrinos are very weird particles. Proposed by Wolfgang Pauli in 1930, they are known as "ghost particles" for their uncanny ability to fly through matter practically as if it didn't exist. In fact, right now, some hundreds of billions of neutrinos per second are going through your body. There is a lot about physical reality that goes undetected by our senses. This ghostly behavior is a consequence of the neutrinos' very weak interactions with other particles of matter, like electrons or protons. Pauli suggested the neutrino to explain missing energy in some experiments. In particle physics, energy is the perfect bookkeeping tool: It needs to balance in and out, being conserved to very high precision. So, if particles come into a collision with a given initial energy (which includes their mass from the E=mc2 relation), they need to have the same total energy after the collision. The name was suggested by Italian Enrico Fermi, who thought of the neutrino as a "piccolo neutron," a small neutron, with no electric charge. In 1962, a group of physicists from Columbia University discovered a second kind of neutrino, associated with processes involving the particle muon, a heavier cousin of the electron. The new neutrino became known as the muon neutrino. Completing the picture, in 1975 a third type of neutrino was discovered at the Stanford Linear Accelerator, the tau neutrino, related to processes involving the tau particle, an even heavier cousin of the electron. While particle detectors were deciphering the strange behavior of the three neutrinos, mystery was collecting in the heavens. In 1968, physicists Ray Davis and John Bahcall had set up detectors 4,850 feet deep in the Homestake Gold Mine in Lead, South Dakota, to search for neutrinos coming from the sun. (Why so deep? So that the rock would block other particles, leaving mostly neutrinos to be detected.) Bahcall had calculated the number of neutrinos that the sun should be producing and sending our direction as it fused hydrogen into helium at its core. To their dismay, the numbers collected amounted to one-third of what Bahcall had predicted. Davis's results were doubted, as no one could make sense of the missing neutrinos. He stood by his experiment as others tried to replicate his results or find the problem. In 2001, McDonald's team at SNO detected neutrino oscillations, the amazing phenomenon where the three neutrinos can change into one another while in flight. Kajita's team had seen strong evidence to the same effect in the Super Kamiokande experiment in 1998, a deficit in the number of arriving muon neutrinos produced in the Earth's atmosphere. This is the reason why Davis detected only one-third of the predicted number: His experiment was only sensitive to electron neutrinos. Once his experimental results were proven to be sound, Davis shared the 2002 Nobel Prize with Masatoshi Koshiba from Japan, who worked on the Kamiokande detector, and with Riccardo Giacconi for his contributions to X-ray astrophysics. Koshiba was able to see neutrinos coming from a supernova event, SN 1987A, a huge star that blew up in the Large Magellanic Cloud. This was a prize for the integration of astronomy with high-energy particle physics, a new way of "looking" at the sky. This year's prize celebrates, once again, the neutrino mystery. The fact that neutrinos can morph into one another implies that they have a small mass. This is very big news, since the Standard Model of particle physics — that combines all our current knowledge of the fundamental particles of matter and their interactions — considers the neutrinos to be massless. 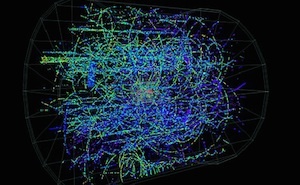 The fact that they have a mass implies that our current picture of the subatomic world is incomplete. Incompleteness is the lifeblood of science. It means that there are new mysteries to be solved, that our scientific narrative continues to evolve as new tools allow us to see a little deeper into the nature of reality. We don't know yet where the massive neutrinos will lead us. But judging from their past history, it's fair to expect that the road ahead will have quite a few surprises.